In the past 40 years, meditation has entered the mainstream of modern Western culture, and been prescribed by physicians and practiced by everyone from business executives, artists, and scientists to students, teachers, military personnel, and -- on a promising note -- politicians. Ohio Congressman Tim Ryan meditates every morning and has become a major advocate of mindfulness and meditation, as he describes in his book, A Mindful Nation: How a Simple Practice Can Help Us Reduce Stress, Improve Performance, and Recapture the American Spirit. Be assured that even if it feels like you have been thinking throughout your entire meditation, you are still receiving the benefits of your practice. You haven't failed or wasted your time. When my friend and colleague David Simon taught meditation, he would often tell students, "The thought I'm having thoughts may be the most important thought you have ever thought, because before you had that thought, you may not have even known you were having thoughts. You probably thought you were your thoughts." Simply noticing that you are having thoughts is a breakthrough because it begins to shift your internal reference point from ego mind to witnessing awareness. As you become less identified with your thoughts and stories, you experience greater peace and open to new possibilities. At the Chopra Center, we commonly hear from new meditators who are able to sleep soundly for the first time in years after just a few days of daily meditation practice. Other common benefits of meditation include improved concentration, decreased blood pressure, reduced stress and anxiety, and enhanced immune function. You can learn more about the benefits of meditation in a recent post, "Why Meditate?" on the Chopra Center blog. In life's paradoxical way, when we spend time meditating on a regular basis, we actually have more time. When we meditate, we dip in and out of the timeless, spaceless realm of consciousness... the state of pure awareness that is the source of everything that manifests in the universe. Our breathing and heart rate slow down, our blood pressure lowers, and our body decreases the production of stress hormones and other chemicals that speed up the aging process and give us the subjective feeling that we are "running out of time." Don't stick with meditation techniques that aren't leading to inner silence. Find a technique that resonates with you. There are many kinds of mantra meditation, including the Primordial Sound Meditation practice taught at the Chopra Center. Or simply follow the in and out of your breathing, not paying attention to your thoughts at all. The mind wants to find its source in silence. Give it a chance by letting go. Really be there. If your attention is somewhere else, thinking about your next appointment, errand or meal, of course you won't find silence. To meditate, your intention must be clear and free of other obligations. Learn practical steps for beginning or enriching your meditation practice by joining Oprah and Deepak for their next free 21-Day Meditation Challenge. 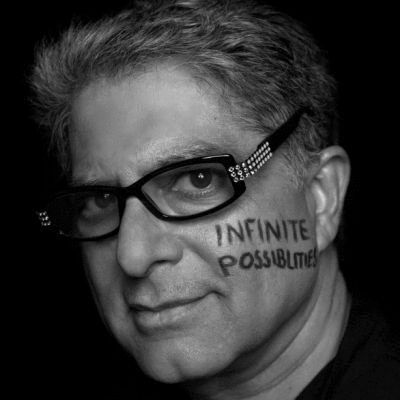 To learn about upcoming events, please visit www.chopra.com.